Some of the attendees of the 32nd annual Interfaith Brunch on February 18, 2019 at the Seasons banquet hall in Township of Washington, Bergen County, New Jersey. Photo courtesy of the organizers. “Living the Change” was the theme of the 32nd annual Interfaith Brunch on February 18, 2019 at the elegant Seasons banquet hall in Township of Washington, Bergen County, New Jersey. It was attended by over 260 participants and elected officials from Bergen County and the State of New Jersey. 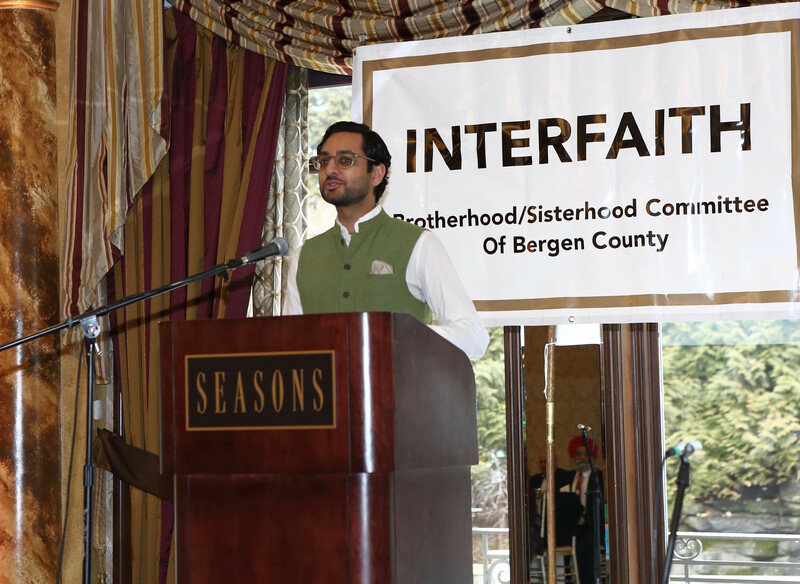 Sponsored by Interfaith Brotherhood/Sisterhood Committee of Bergen County, a coalition of nine faith traditions, and hosted this year by the Hindu community, this year’s event focused on interfaith initiatives for climate action and environmental sustainability, according to a press release. Each of the 9 participating faith communities, Baha’i, Hindu, Jain, Jewish, Muslim, Protestant, Roman Catholic, Sikh and Unitarian Universalist, set up tables with displays from their religious teachings on respecting and protecting the environment. Gopal Patel, director of Bhumi Project at Oxford Center for Hindu Studies and Greenfaith, gave the keynote speech. Photo courtesy of the organizers. Gopal Patel, director of Bhumi Project at Oxford Center for Hindu Studies and Greenfaith, in his keynote speech emphasized the dire consequences of climate change and the need to restore balance and harmony between earth and nature. He mentioned the two questions asked by the Hindu seeker, which are “Who am I?” and “What is the purpose of human life?” Rooted in his Vedic spiritual teachings, he translated the mantra from Rigveda explaining that God is all pervading and humans should be reverent, grateful and compassionate towards earth by living a life of spiritual purity and awareness. A leading figure in international faith based environmental movement, Patel offered practical solutions to reduce carbon footprint by making climate friendly lifestyle changes and urged the participants to reduce meat and dairy consumption and eat a healthy plant-based diet. He encouraged travelling by mass transit and reducing air travel. He also encouraged the installation of solar panels to lower the energy consumption. ‘One of the questions he asked was, what contributes most to the climate change? a) The food we eat b) The way we travel c) The energy we use. How does it impact our lives? Where and how can we make a difference? It is our moral responsibility to reconnect with earth. Be in Harmony and in balance with Mother Earth,’ the press release said. The program included round table discussions on climate change during the lavish and delicious vegetarian brunch. The summary of these discussions was presented as the memorandum on climate action by the Interfaith Committee. Also included in the program were unity prayers on the environment by representatives of the nine faith communities, the enthralling Hindu prayer dance and joyful music by the interfaith youth choir.